Retail and eCommerce companies are focused on making a lot of investment in virtual fitting room solutions to reduce inventory cost, inefficiency, and time wastage. By deploying virtual fitting room platform into the operations, retail and eCommerce companies can offer personalized ads to individual users based on their online activity. Moreover, it enables personalized retargeting and buying and selling of individual page views in real time. By component, the market is segmented into hardware, software, and services. Among these, software is expected to hold the largest market size during the forecast period due to the increasing adoption of software tools and platforms is the market. Based on services, the market is segmented into consulting, integration, and support. In the market, support services are growing at a fast pace, as it is becoming a powerful service to engage the target audience. Support services can be provided to retailers across eCommerce and in mobile applications. The growing time spent by users for online shopping and surfing the Internet on mobile and other devices is inspiring various retailers to invest in the virtual fitting room services. 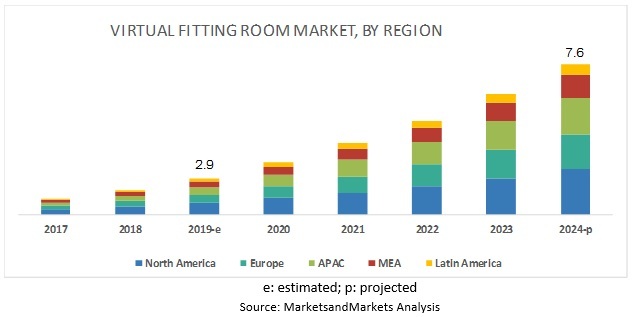 North America is expected to hold the largest market size in the global virtual fitting room market, as the region has a maximum number of smartphone users. 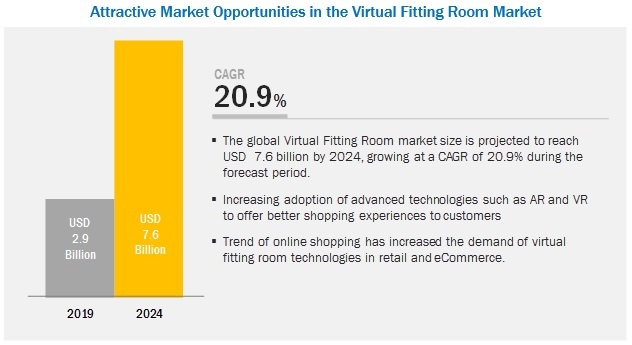 Furthermore, the time spent by these users on shopping online is also increasing; hence, to target these large number of customers, retailers are focusing on deploying virtual fitting room solutions into their operations. Whereas, APAC is expected to grow at the fastest rate during the forecast period. The growth across the region is due to the increasing adoption of advanced technologies among retail and fashion industries; the region is expected to witness significant growth during the forecast period. Some of the major virtual fitting room vendors include Zugara (US), Total Immersion (France), True Fit (US), Metail (UK), 3D-A-PORTER (UK), Magic Mirror (UK), AstraFit (US), Fit Analytics (Germany), Visualook (Spain), ELSE Corp (Italy), FXGear (Korea), Sizebay (Brazil), triMirror (US), MemoMi (US), SenseMi (UAE), Fision Technologies (Switzerland), and Coitor IT Tech (India). 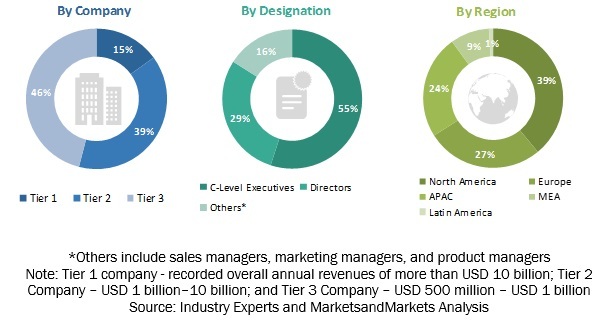 These companies have adopted various organic and inorganic growth strategies, such as new product launches, product enhancements, partnerships, agreements, to further expand their presence in the global market. Metail is one of the key players in the market. Moreover, the company is undertaking various growth strategies to stay competitive in this market. In the virtual fitting room market, Metail is undertaking partnership strategies to compete with various solution providers. For instance, in May 2017, Metail partnered with Princess Polly, the fastest-growing fashion brand. This partnership helped Metail enter the Australian market and enabled shoppers to try clothes online. Zugara is one of the key players in the virtual fitting room market that primarily offers virtual fitting rooms and generates maximum revenue from the same. The company uses augmented reality and computer vision technologies to solve user interaction. Moreover, the company has key patents in the AR space. Zugara is constantly looking at how they can integrate different technologies with AR and VR platforms to create innovative use cases. The company has its resellers present across the globe to sell its products. In May 2017, Metail partnered with Princess Polly, the fastest-growing fashion brand. This partnership helped Metail enter the Australian market and enabled shoppers to try clothes online. In January 2018, True Fit secured funding of USD 55 million. This funding would help True Fit develop its AI data platform and make innovations out of its personalized style and analytics solutions. Moreover, it would expand the company’s offerings, such as Chabot virtual stylists and enhanced visualizations. What are the current trends in the virtual fitting room market driving the demand for technological advancements? What are the regulations that are impacting the market and use cases of various vendors providing virtual fitting room solution and platforms? What are various developments undertaken by key players in the market and competitive analysis of vendors? How is the adoption of virtual fitting room across the various region? What are the major use cases in the virtual fitting room market? *Details on Business Overview, Solutions/Products/Platforms Offered, Recent Developments, SWOT Analysis, and MnM View Might Not Be Captured in Case of Unlisted Companies. The study consists of 4 major activities to estimate the current market size of the virtual fitting room market. Exhaustive secondary research was done to collect information on the market, the peer market. The next step was to validate these findings, assumptions, and sizing with the industry experts across the value chain through primary research. Both the top-down and bottom-up approaches were employed to estimate the complete market size. Thereafter, the market breakup and data triangulation procedures were used to estimate the market size of the segments and sub-segments of the virtual fitting room market. In the secondary research process, various secondary sources, such as D&B Hoovers and Bloomberg BusinessWeek have been referred to for identifying and collecting information for this study. Secondary sources included annual reports; press releases and investor presentations of companies; white papers, certified publications, and articles by recognized authors; gold standard and silver standard websites; regulatory bodies; and databases. Various primary sources from both the supply and demand sides of the virtual fitting room market were interviewed to obtain qualitative and quantitative information for this study. The primary sources from the supply side included industry experts, such as Chief Executive Officers (CEOs), Vice Presidents (VPs), marketing directors, technology and innovation directors, and related key executives from various vendors who provide the virtual fitting room solutions and associated service providers operating in the targeted regions. All possible parameters that affect the market covered in this research study have been accounted for, viewed in extensive detail, verified through primary research, and analyzed to get the final quantitative and qualitative data. The market size, in terms of value, has been determined through primary and secondary research processes. With data triangulation and validation through primary interviews, the exact value of the overall market size was determined and confirmed using this study. The overall market size was then used in the top-down procedure to estimate the size of other individual markets via percentage splits of the market segmentation. This research report categorizes the virtual fitting room market based on use cases, components, end user, , and region.